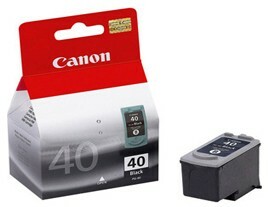 Genuine ink cartridges for your Canon printer are cheaper than ever when you order 2 or more Canon PG-40 Ink Cartridges. With unsurpassed results, genuine Canon PG-40 Ink will give you a print out that not only meets your printing requirements, but excels them. With its razor-sharp edges and chiseled lines, genuine Canon PG-40 Ink does not disappoint. Whether you need black ink cartridges for your work document print outs or simple want to commemorate a special message in ink, Canon PG-40 Ink is the ideal way to do it and with deals online when you buy multiple cartridges, there's no better time to get your Canon PG-40 Ink.